Allahabad: Accusing senior doctors of harassment and suspending him for no reason, a junior doctor attached to Swaroop Rani Nehru (SRN) hospital, attempted suicide by consuming sleeping pills. Meanwhile, other junior doctors at the hospital went on strike to protest their colleague’s alleged harassment and suspension. Dr Pramod Kumar Gupta is pursuing MD in medicine and is in his 3rd year of postgraduation. Before his suicide bid, Dr Gupta wrote a seven-page suicide note, in which he listed the series of dealings which made him take this drastic step. It all started when the OBC certificate of his niece, who had come to the medical college for NEET counselling, was rejected by the authorities. During the discussion over the issue, an argument ensued between Dr Gupta and the nodal officer Dr Debashish, Dr RD Kamal and AK Saroj, as mentions report by Jagran. Further to the dispute, the principal of the MLN Medical College, Dr SP Singh suspended Dr Gupta, asking him to refrain himself from clinical and teaching activities. 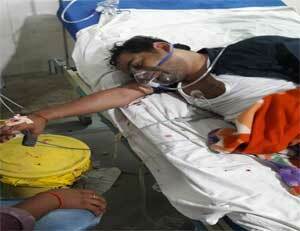 Trying to end his life, he consumed 32 sleeping pills altogether at his hostel inside the hospital campus on July 4. Fortunately, the next morning, when the fellow hostellers saw him unconscious, they and Dr Gupta’s family members took him to the hospital ICU where his condition is stated to be stable now. When asked about the suspension, the principal MLN Medical College claimed to TOI that Dr Gupta was not suspended from the college, but was suspended only from clinical and teaching activities. When the news reached his fellow doctors, they went on went on strike for 5 hours on July 5, protesting against Dr Gupta’s alleged harassment and suspension. The protesters shut down the OPD, emergency, dialysis services at the hospital and nearby medical stores during the protest. Jagran reports that the college administration ended the dispute at around four o’clock in the evening, by apologizing to Dr Gupta and revoking his suspension, after which the doctors resumed work. “The suspension has now been revoked,” Dr Singh confirmed. Wondering..whether could a common Man influence the admission process and inside man recommend to accept the OBC certificate…and then argue with the seniors and force them to accept. Why does Garima not post the suspension letter. Tomorrow if Garima is fired from her job…she will consume pills and mention seniors harassing me. In this country you can\’t take action against anyone. Media always tells half story. Let this be properly investigated. He took 32 sleeping pills.One pill of celphos would have been enough if he really wanted to commit suicide.All drama. Can some post if this doctor got selected by his own merit or was awarded 40 percent extra marks for being in PM\’s services. Its so tough for authorities to work.. strike culture getting rampant.. If authorities were at fault, complain.. let their be a proper way to deal this.. not this way .